Lambing takes place much later in the Highlands than further south, and the April lambing is a welcome sign both of Spring and of new life. These two are barely a week old, and they will rapidly grow, gain confidence, and become playful. 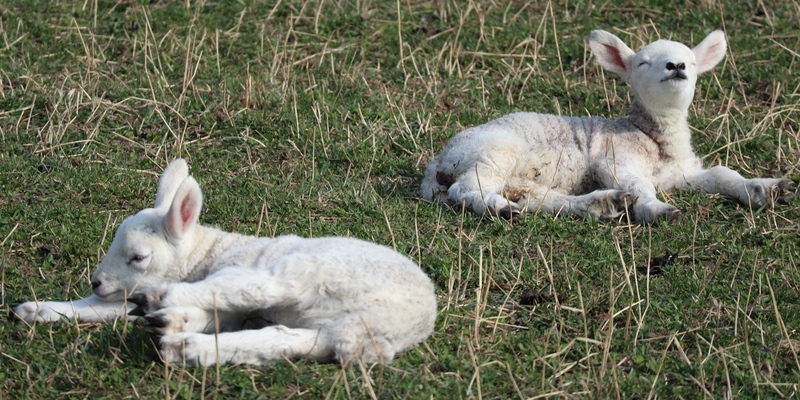 Lambs are often used as symbols of gentleness, innocence, peacefulness and purity, and also sacrifice and self-sacrifice. While for much of the time, sheep actually need less management than other farm animals, the shepherd has become a widespread symbol of God’s care for people and the role of pastoral care. We’ll continuing the revision of the site during the Spring, so do keep an eye on how we’re doing, and let us know what you think. Articles and other contributions to the content are always welcome. Pleases don’t forget to keep us updated with the regional groups. You might like to check out the revised Books and Reviews section, which has some new suggestions for your reading, and some new reviews; there will be more to come as the year progresses. Details are now available for the Annual Conference in May (13th-15th at the Hayes, Swanwick). All the main speakers are now confirmed, and most of the speakers’ profiles and workshop details are now in. Please download copies of the Conference Poster, the Booking Form, and the Conference Programme and book your place. As well as being very rewarding, both professionally and personally, it’s also an effective way to gain most of the annual CPD points that the UKBHC requires. The conference always seeks to provide professionally relevant training – this year’s conference is strongly geared to the current issues that we are facing within chaplaincy. As Karen’s latest letter says, we’ve had to increase the price this year – for the first time since 2012 – but we still believe the conference offers very good value considering the quality of the speakers and full board accommodation. If you havn’t renewed your AHPCC membership, or wish to join the AHPCC, you can download the Membership Form here to do so. Whether you’ve worked in palliative care for years or you’re new in post, we hope you find this website helpful. We update it constantly, normally with a monthly home page update, and alerts also appear via Facebook, especially where new vacancies are being advertised. Contributions of articles and resources, etc are welcome.